QuoteWerks CPQ enables Dell Premier Partners to integrate the tools and resources Dell provides into a quoting solution designed for speed and efficiency. Instead of wasting time and risking costly errors by manually entering information, QuoteWerks does the work for you — quickly creating professional quotes and proposals for your leads, prospects, and customers. The QuoteWerks Dell integration enables Dell Premier Partners with Punchout credentials to import Dell order Requisitions from the Dell Premier portal and place electronic orders directly from QuoteWerks. Users can initiate a new Dell order requisition from within QuoteWerks, choose items on the Dell website (or select a quote your Dell sales rep created for you), and then import those items into the QuoteWerks quote. 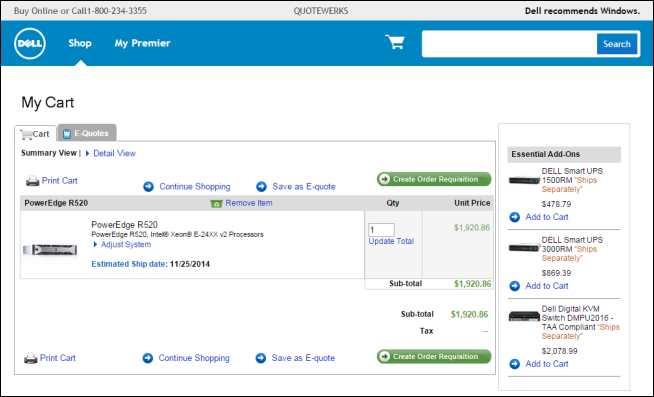 QuoteWerks can then order those items electronically through Dell. If you are not a Dell Premier Partner or do not want to use the Dell Premier Portal Punchout Functionality, QuoteWerks can import Quotes created by your Dell Sales Representative using our Quote Importer.